As a dog groomer it is inevitable that you will build some very close relationships with clients who bring their pets to get groomed regularly. I’ve become quite fond of the pets after doing them for years and years. Now that I have been grooming for over 12 years, I have lost many many of my pet clients to old age and also to sudden accidental deaths. It breaks my heart. After loosing many loving pets in my life I know how hard it can be and I always want to do something special for the owners. This is why I want to share with all of you about the first time I ever sent a canvas portrait to one of my clients who had lost their two cairn terriers within months of each other. The first time I bough a pet canvas for a customer was for an older couple whose kids had grown and started their own families. Bentley and Higgins were their babies now and they loved them dearly. This couple was amazing clients who were very appreciative of my work and how much I loved their dogs while they were in my care. I knew when Bentley and Higgins past I had to do something extra special for them. 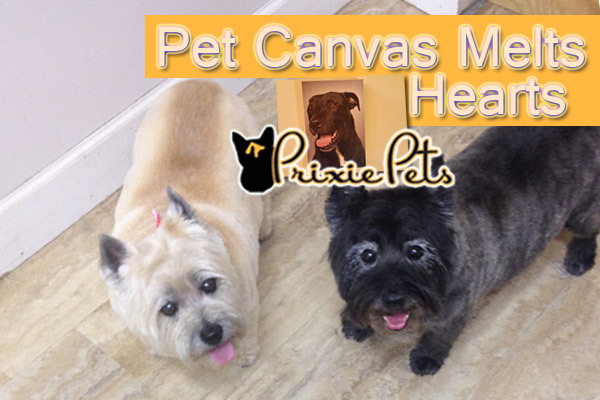 While many of the pets are at my grooming shop I like to take pictures of them to show the owners or post online, so I knew I had a great picture of the dogs and had recently saw a great coupon for making canvas prints from……….. I went to their website online , uploaded my picture, and turned it into a small canvas print for these clients. It got sent directly to them and they loved it! They loved it so much so that one of the owners called and left me such a heart felt message (as seen above), plus even a representative from the company I ordered the canvas from called me to thank me for doing such a nice gesture for someone. She said that when the owner called the company to find out who sent it the representative could hear just how touched she was. Later on that month the owners came to visit me and brought the canvas to show me. I was very impressed by the quality and so happy it brought them so much joy. I now give canvas portraits for almost any occasion. A birthday, anniversary, Christmas or just because I am thinking of someone! If I have a great picture I don’t want it to sit on my phone or computer. With this digital age we are in now I find people physically have pictures less and less. Friends and family members really enjoy getting these as gifts because of that! Not only are canvas prints a good idea for pet lovers, you can also put pictures of your family, babies, cars or anything else you want to hang on the wall. Get the Prixie Pets Newsletter straight to your inbox to see new articles and videos as they’re released and stay connected to our community! Have you ever done this for someone? Can you think of something we missed? We want to know, and so do the readers here, on Prixie Pets. Leave some love below – thanks!